The empowering reason behind the Celine Dion fashion moment 2017. Celine Dion is having a lot of fun with fashion, and the reason is beautifully significant. In case you’ve missed it, Celine Dion is having a whole lot of fun with fashion right now. 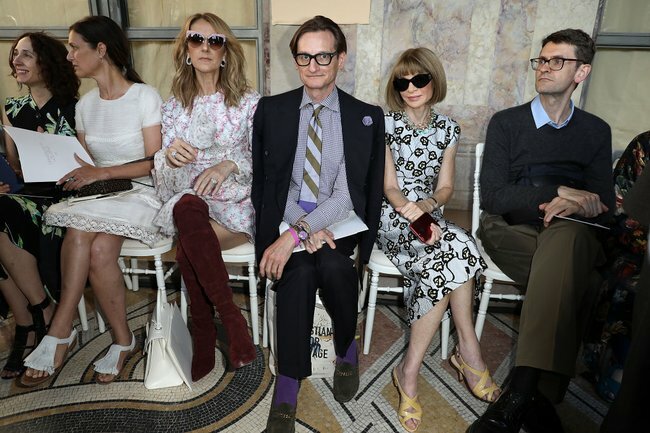 In the last few weeks alone, she’s been snapped front row next to Vogue editor Anna Wintour. Making thigh-high brown suede boots seem like a logical purchase. Jumping up and down with delight (a traditional big no-no in the fashion) at the haute couture shows in Paris. Just today, a video of Dion by Vogue was released featuring the singer in outfits from the top design houses, including eating french fries while dressed in an experimental ensemble from John Galliano. The paparazzi and fans alike camp outside wherever she is staying in the hopes of getting that first glimpse at her latest sartorial ensemble. They’re a bit kooky, slightly crazy – and the world is loving it. The singer never really previously acknowledged by the fashion set, is the street style star of 2017. She can’t put a designer-clad foot wrong. Celine Dion is having a lot of fun with fashion. Rewind 18 months ago, and the Titanic singer was going through a time you wouldn’t wish on your worst enemy. Just two days after losing her manager and husband of 22 years Rene Angelil to throat cancer in January 2016, the 49 year old’s brother Daniel also passed away from cancer. Dion and Angelil met when Dion was just 12 years old and after marrying in 1994 had three sons together: Rene Charles, 16, Eddy and Nelson, six. Far from being frivolous, clothes can be an important part of the grieving process. "After a major life event it is common for us to lie low for a bit to reflect, heal and rest. When the time is right we re-emerge but we are never the same," explains Australian based Personal Style Specialist and President of the Association of Image Consultants International Melbourne Chapter Donna Cameron. "Significant experiences do change us. Generally we learn and evolve through these experiences so the way we presented ourselves to the world prior to a major life event often doesn&apos;t feel right for us anymore. Many of my clients seek me out to introduce them to new ways of expressing themselves sartorially. "If we&apos;re moving on after a loss, it&apos;s reassuring to know we can pick ourselves up and reinvent ourselves." If that was the start of her healing, then right now we&apos;re seeing a new chapter of Dion, still carrying her grief but looking forward to the future. "[After loss] It&apos;s about putting your best foot forward by feeling great about yourself by the clothes you wear. That could be updating or changing your style completely or treating yourself. It&apos;s very much about saying &apos;I deserve this&apos; after going through bad times," explains Sally Mackinnon, personal stylist at Styled By Sally. "Part of her reinvention is her saying &apos;I deserve this, I&apos;m still here and I&apos;m making the most of my life&apos;. You only get one shot and life is too short." The significant (at least perceived) reinvention of Dion&apos;s style coincides with her joining forces with &apos;image architect&apos; Law Roach, who also works with Spiderman: Homecoming actress and singer Zendaya Coleman. Dion reportedly discovered Roach through her children who were fans of Zendaya&apos;s Disney Channel sitcom K.C Undercover and reached out to him. "My first words were: &apos;Céline who? &apos;I don’t think I had dreamt that big of a dream. That this legend, this woman who we’ve all grown up to her music, that’s been around for 30 years, was calling me to work with me," Roach told Vanity Fair last week. A few days working together in Paris for Fashion Week last year turned into a month, which has now been a year. The outfit that started it all was ironically a hoodie and jeans, when Roach dressed the 49 year old in a Titanic jumper from tongue-in-chic label of the moment Vetements. The ironic reference sent the internet alight. "When I put Celine in that Vetements, she had literally just lost her husband a few months before. She was probably at the beginning stages of her healing process, and so she was becoming a different woman," Roach told W Magazine last month. "She had been with René [Angélil] for most of her life, and now all of a sudden she&apos;s a single mother and she&apos;s an artist on her own. So, his talent of creating this new woman fit with her actually becoming a new woman. It was incredible." But rather than a reinvention or comeback, Roach says the fashionista was in Dion all this time. "I wish I could take credit for introducing Celine Dion to this whole new world. But she’s always lived in this world; she just did it quietly," he said. "Like, she performs in couture at her Vegas shows. She buys couture. Since we&apos;ve been working together, I think I just grabbed all the fashion kids and was like, ‘Look at this woman!’"
Perhaps the biggest example of the change in attitude can be seen with her recent all-white Ralph and Russo outfit. Look familiar? It&apos;s giving off more than a few vibes to the white backwards tuxedo Dion wore to the 1999 Oscars where it was largely panned. Now it&apos;s adored, proving that perhaps Dion has always just been ahead of her time. Part of her success is arguably that she&apos;s not afraid to experiment. "She’s not afraid to wear any colour, shape or brand. She’s excited about things that are new,” Roach told People Magazine last year. "It’s refreshing that she’s in her 40&apos;s and has no hesitation about fashion. It has been such a dream to work with her. "I’m here almost every day and it makes me so happy to see her so happy. If I had a small piece of [creating] that with the clothes and the fittings and the shoes and the bags, then I am overjoyed." Although Dion has spoken of her desire to "play" with fashion, she&apos;s yet to share in her own words how her wardrobe has reflected her emotions during a difficult year and a half. Nor is she under any obligation to. Either way, it&apos;s a joy to see. "I&apos;m in my mid forties so it&apos;s great to see someone like Celine Dion getting exposure, being talked about and being photographed," says Mackinnon. It&apos;s also an empowering and hopeful message to anyone else going through loss, grief or despair that there can be light ahead. "I work with everyday women and what she proves to people is that clothing can be powerful. It&apos;s easy for people to dismiss clothes and fashion to as not important or superficial. People don&apos;t understand the relationship [with our emotions]. "It doesn&apos;t need to be expensive clothes either, it&apos;s just about looking and feeling great in clothes. Anyone can come back from anguish and despair and clothing can be part of that healing progress." Has fashion helped you through a difficult period?